MAPLE LEAF SQUARE Condos For Sale! Lanterra Development And Cadillac Fairview, the team that will be bringing us ICE Condos will be bringing Maple Leaf Square Condo. Located Beside ACC this will be the coolest address in Toronto. With great views of Lake Ontario or the Toronto Skyline. The Maple Leaf Square has been designed by two of the best Canadian architectural firms, KPMB and Page + Steel. This 54 storey high rise will contain 872 units with over 35,000 Sq Ft of residential amenities including indoor and outdoor swimming pools, fitness facilities, recreational room and state of the art home theatre and business centre. The Condo is complete with a three floor retail space and Hotel (The Le Germain Hotel) where the visiting teams will be staying. Only an elevator ride to a 6,000 square feet 5 star fine dining restaurant which can cater to 160 diners at any given time. As well 20,000 square feet high tech sports bar which can accomodate more than 600 diners watching sports has never been so simple. Grocery shopping has never been so much fun. A 45,000 square foot Longos will enhance any shoppers experience. The specialty market will host selections from around the world. Daycare will be provided giving residents and tenants priority. With 6,000 square feet of indoor space and 3,000 square feet of out door space. The Daycare can be accessed through its own elevator on the third floor. Steps To Union Station, ACC, CN Tower, And Rogers Center. Seconds To The Financial District. 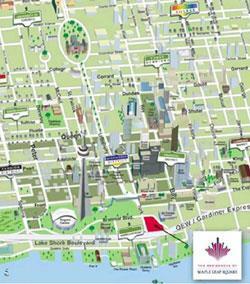 The Convenience Of Toronto Is Right Outside Your Door Steps; From Harbour Front To Uptown. Interested In This Sold Out Maple Leaft Condo Project? Drop Us A Line About Assignments Available.